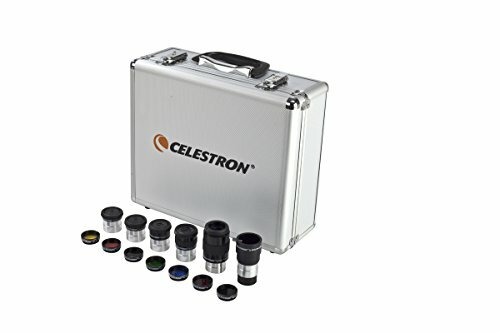 The Celestron 1.25 Eyepiece and Filter Kit is a great way to expand the functionality and enjoyment of your telescope. Inside the metal, foam-lined carry case you ll find these accessories: 32 mm Plossl Eyepiece - 1.25 17 mm Plossl Eyepiece - 1.25 13 mm Plossl Eyepiece - 1.25 8 mm Plossl Eyepiece - 1.25 6 mm Plossl Eyepiece - 1.25 2X Barlow Lens - 1.25 #80A Blue Filter - 1.25 #58 Green Filter - 1.25 #56 Light Green Filter - 1.25 #25 Red Filter - 1.25 #21 Orange Filter - 1.25 #12 Yellow Filter - 1.25 Moon Filter - 1.25 Eyepieces - All five Plossl eyepieces can be used in any telescope with a 1.25 focuser. Each eyepiece features a four-element design with a 52 apparent field of view. The optics are fully multi-coated to improve light transmission and protect the optics. The 32 mm Plossl eyepiece offers a low power, wide field view in most telescopes, the 13 mm & 17 mm focal lengths are good medium-power oculars, and the 8 mm & 6 mm eyepieces provide high magnifications, great for the Moon and planets, especially when seeing conditions are good. 2X Barlow Lens - The included, and very versatile 2X Barlow doubles the magnification of any 1.25 eyepiece. Since this kit includes five (5) eyepieces, you will be able to use them with and without the Barlow, giving you a total of ten magnification options in all. Any other 1.25 eyepieces you already have will also work in this desirable accessory, giving you even more magnification choices. Remember, high magnifications do not always produce clear, sharp results, especially on evenings of poor or moderate seeing conditions. Experiment to find the magnifications that are best for your telescope on a particular night. Filters - Colored filters can be used to bring out certain details on a planet s surface or its cloud structure. All of the planetary filters included in the 1.25 Eyepiece & Accessory Kit, as well as the Moon filter, can be used on any 1.25 eyepiece with the proper filter threads, so they are very versatile. Just screw one onto your eyepiece of choice and slide it into the focuser. The Moon filter is one of the first accessories most new amateur astronomers buy, and for good reason! It helps block out a portion of the light the Moon sends into your eyepiece so that you can see details better. You can also try this filter on Venus; it blocks enough glare so you can observe the planet s phases more easily. Metal Case: The sturdy metal carry case has die-cut foam inside to protect and cushion your accessories. Store each one in its appointed place when not in use and you ll keep them looking and performing like new. The case is even large enough to carry a few extra accessories. Just pull out enough of the foam cubes to make a nest for your eyepiece, camera adapter, etc. A tight fit is better, so remove the least amount of foam possible before testing the fit. You can always remove more if you need to. 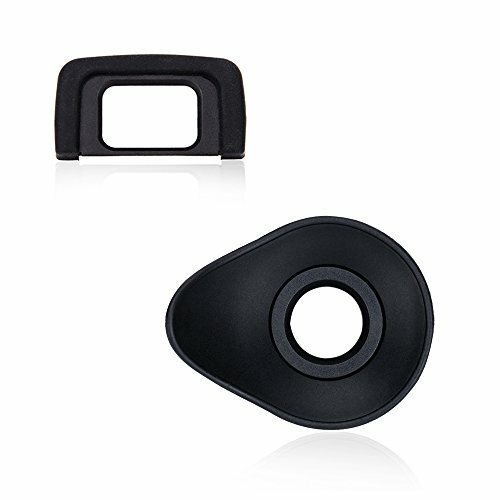 JJC Two types camera eyecup viewfinder are specially designed for Nikon, and can be used to replace Nikon DK-25 Eyepiece. Be Suitable for the professional technicians. Nikon D5600, D5500, D5300, D5200, D5100, D5000, D3500, D3400, D3300, D3200, D3100, D3000, etc. 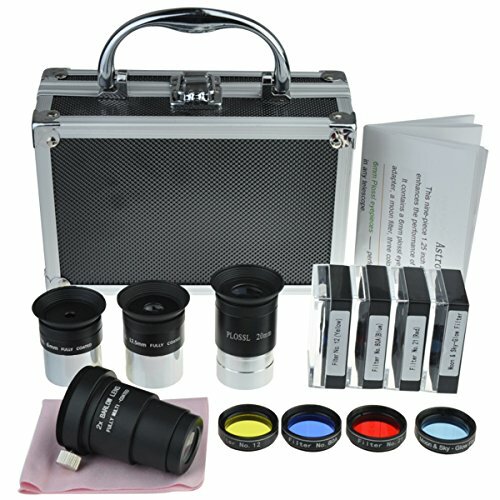 It contains a 6mm plossl eyepiece, a 20mm plossl eyepiece, a 2x berlow lens/ T adapter, a moon filter, three color planetary filters(Red, Blue, Yellow), a Chamois cloth and a handy aluminum case. 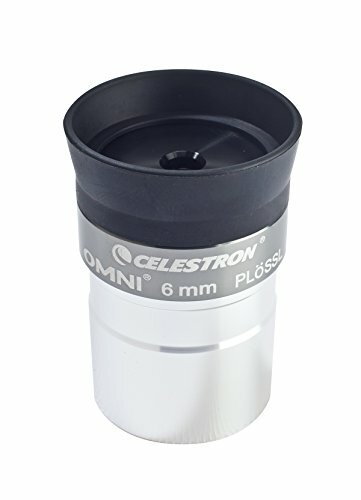 6mm Plossl eyepieces -- perfect for high-power planetary and lunar observation in any telescope. 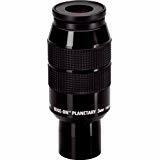 12.5mm Plossl eyepieces -- A medium eyepiece for moon, star observations. 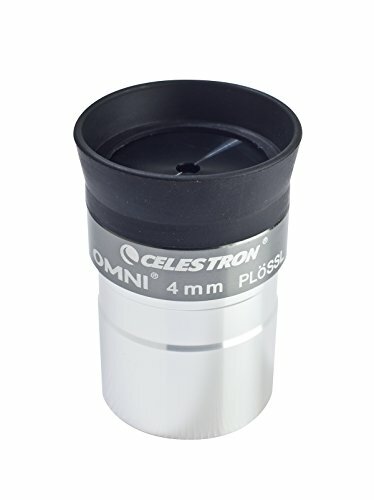 20mm Plossl eyepieces -- perfect for broad-field lunar observations, medium-sized star clusters, and a wide range of cloudy nebulas and deep-sky targets. Moon filter -- helps to dim the bright light from the Moon, making it more comfortable to view so you can see more detail and surface features. 3 color planetary filters -- The three color filters (Red, Blue Yellow) highlight features on Mars, Jupiter, and Saturn.They are an essential tool of the lunar and planetary observer, for filters permit the observation and photography of surface detail that is often virtually invisible without filtration. 2X Barlow lens -- A visual Barlow, doubles the magnification of any inserted 1.25 inch eyepiece. A prime focus T-adapter for attaching a DSLR camera. With the T2 threads (M42x0.75), you can attach a T-ring for astronomy photography. 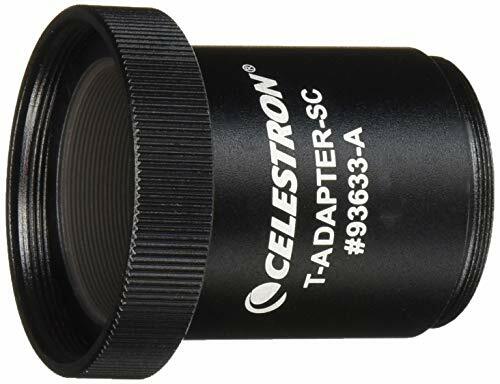 A tele-extender for increasing the focal length of the telescope when attaching a DSLR camera. An Handy Aluminium Case: Easy to take and keep the accessories clean and safe. All filters, eyepieces and barlow comes with dust caps, dust plugs and cases. Moon filter -- helps to dim the bright light from the Moon, making it more comfortable to view so you can see more detail and surface features. 3 color planetary filters -- The three color filters (Red, Blue Yellow) highlight features on Mars, Jupiter, and Saturn.They are an essential tool of the lunar and planetary observer, for filters permit the observation and photography of surface detail that is often virtually invisible without filtration. Also called a dew shield, a lens shade is an essential accessory that protects your optical tube from excess moisture forming condensation on the corrector lens. A lens shade also helps block out stray light outside the path of the telescope for better viewing and astroimaging. This versatile lens shade can accommodate both 6" and 8" Schmidt-Cass grain optical tubes. Choose the outer Velcro strip for larger tubes and the inner strip for smaller tubes to customize your fit. Also compatible with the 8" EdgeHD optical tube. 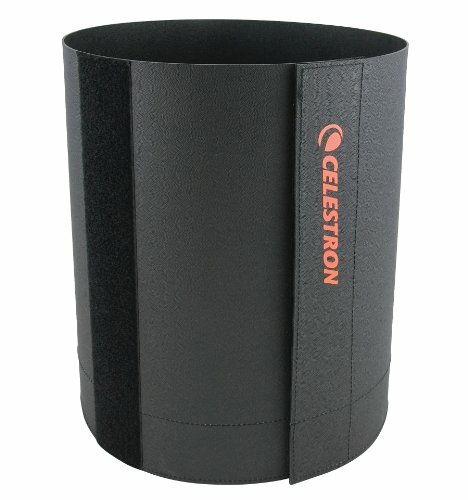 Fits all Celestron 6 inch and 8 inch tubes. To get started, you ll need the appropriate T-Ring for your camera body (#93402 for Nikon & #93419 for Canon EOS). Remove the lens from your camera and attach the T-ring in its place. Since the T-ring is camera-brand specific, it will snap right on just like a lens. Next, remove the diagonal and visual back from the rear cell of your telescope. Screw the Celestron T-Adapter onto the rear cell threads until secure. Now, thread the T-ring & camera onto the T-Adapter. That s all there is to it. The camera is now using your telescope as a giant telephoto lens. The magnification will depend on the telescope s focal length. For instance, a 300 mm camera lens is considered to be pretty powerful, right? Well, if you are using an 8 SCT at prime focus, you ve got yourself a 2000 mm lens with a lot of light-gathering capability! Edge-On Planetary eyepieces bring flat-field performance to solar system viewing in the form of three high-magnification focal lengths. Each employs a sophisticated 7-element lens design reminiscent of exotic, high-priced oculars to provide a sharp focus all the way to the edge of their wide 55-degree apparent field of view. The barrel distortion and field curvature aberrations common in standard eyepiece designs are virtually gone. Edge-On Planetary eyepieces let you push the power, whether you're canvassing the lunar terminator or studying the Jovian cloud belts. The 7-element optics are fully multi-coated for high light transmission, and each eyepiece has 20mm eye relief for viewing comfort. Other nice touches: blackened lens edges, pop-down rubber eyeguards, and barrels threaded for 1.25" filters. Barrel diameter: 1.25". Angular Field of View: 2 40"
Wireless Bluetooth Remote No apps needed to download for use simply connect to phone. You only need to pair the remote control with your smartphone once, pictures can be taken up until 30 feet away. Lightweight and small enough to fit in pocket or as a keychain. 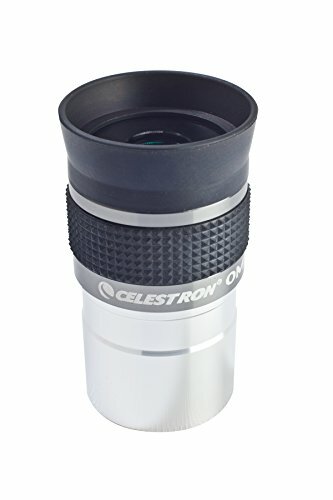 Ultra - Clear Telescope With 350mm focal length and 60 mm aperture to capture more light picture and optical glass coated for enhanced image brightness to protect your eyes. A fantastic refracting telescope for astronomy beginners and kids to explore the space. High Quality Optics The interchangeable eyepieces with a 3x Barlow lens increase viewing power, 5*24 finderscope with mounting bracket, erect-image diagonal and two eyepieces(K10mm: 35X, K25mm: 14X) make locating objects easy. Cost Effective We have our own factory, so we can offer you the lowest price and the best service. 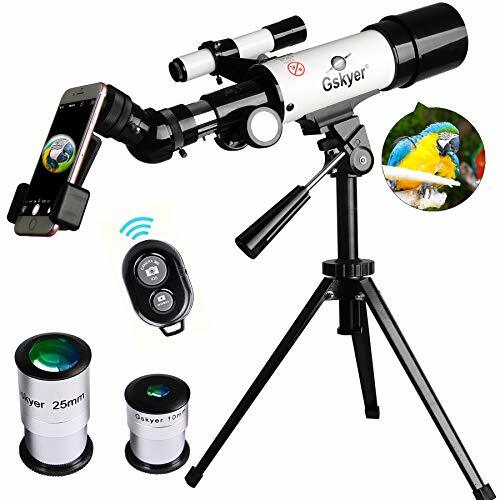 Easily obtainable under 80 dollars with Gskyer telescope, most likely save much money compared to other's. It is a collection of combination of quality, property, price and appearance advantages, which is exclusively designed for beginners. Quality Guarantee 100% satisfaction guaranteed, our product comes with 12 months manufacturer's warranty. We will replace or refund if you have any concerns. Warranty: NEVER aim your telescope at the sun or even close to the sun! Special eyepiece fits into 1 focusers or diagonals. Imagine you are observing on a clear night, but your enjoyment is spoilt due to the wind or a nearby road making the image in your telescope unsteady. Small vibrations are being transmitted directly to the image. This does not need to be a problem - These new Astromania vibration suppression pads reduce vibration and provide you with a steady image for an enjoyable night's observing. 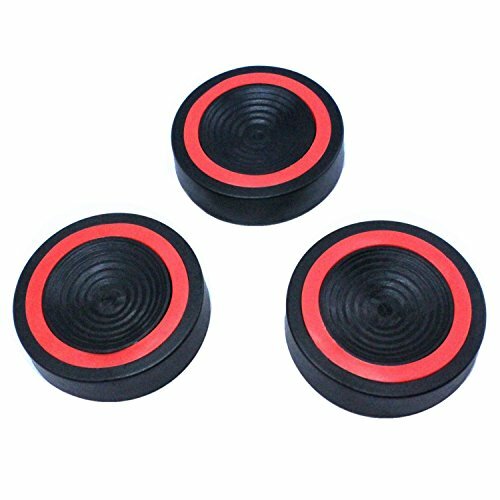 Prevent vibrations - always and everywhere: Just take these anti-vibration pads with you to every observing location - they are the perfect base, both for hard and soft surfaces. On soft surfaces, such as grass, the pads will also prevent the tripod feet both from becoming dirty and from sinking into the ground. Even when you carefully levelled your telescope first, it will remain level when using the anti-vibration pads. Astrophotographers and visual observers love a steady image: A stable image is a must for successful exposures if you want to photograph the night sky. Suppose your telescope is standing on a balcony, terrace or concrete platform. Every step you take is transmitted directly to the telescope and shakes the image around. These flexible vibration-suppression pads insulate the telescope from such vibrations and the result is a stable image. And they let you walk around your telescope without having to worry. These pads are sold in sets of 3 (one for each tripod leg) and fits under most tripod feet and works on any surface, dampens out tripod vibrations from the wind or from touching the scope. These pads are designed to reduce vibration time by almost 100% and decrease vibration amplitude when placed under each of your tripod legs, prevents dirty tripod feet. Makes observing possible when located near to roads, stops the tripod's feet sinking into softer surfaces. 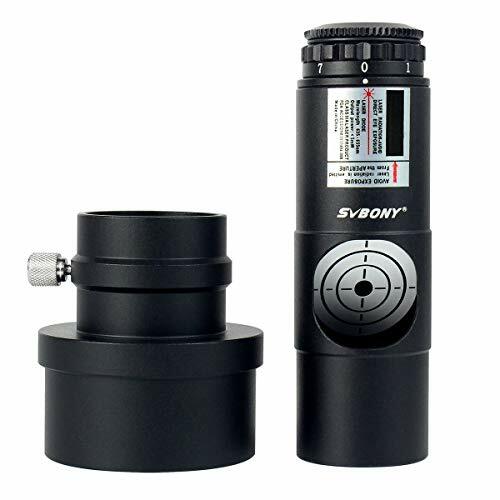 Ideally suitable for astronomy, nature observations, photography and much more. Reduces the oscillation time for the image to settle down and stop shaking and muffles the strength of oscillations. Celestron Omni series eyepieces offer a 50 apparent field of view, perfect for the Moon, planets, and a plethora of deep-sky objects. The premium four-element optical set is finished with multiple layers of high-transmission coatings for clear, sharp images. The edges of the optics are blackened for increased contrast. The Omni eyepiece body is made of aluminum. A two-step anodizing process results in a beautiful matte finish that resists reflections and glare. Each eyepiece in the Omni Series includes a black rubber eyecup. It can be left up or folded down for better observations while wearing eyeglasses. Models with a longer barrel (15 mm, 32 mm, 40 mm) include a rubberized grip for non-slip handling during observing sessions. The insert barrel is threaded to accept 1.25 filters. Moon Filter -1.25 -A moon filter reduces the brightness of the moon and improves contrast so that greater detail can be observed on the lunar surface. The filter has threads on it which screw into the bottom of the eyepieces. 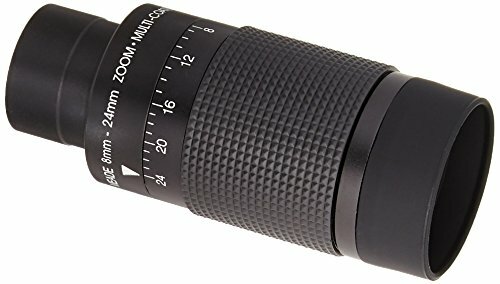 This GazerOptics 20mm medium power plossl eyepiece is an excellent "just right" eyepiece with the standard rubber eye guard and threaded base for various filters. This eyepiece features fully coated optics with anti-reflection coating. This coating allows more light to pass through the eyepiece so you are rewarded with a bright, detailed view. The eyepiece barrel is threaded to reduce glare. Both the full optical coating and threaded barrel work together to minimize internal reflections. 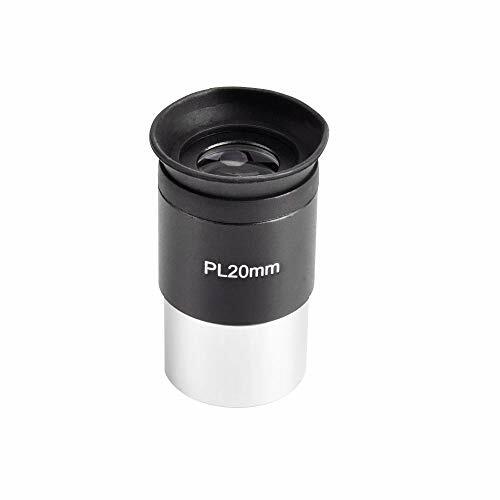 With a 20mm focal length and 1.25" barrel diameter, this plossl telescope eyepiece will yield medium-power views in any telescope. Perfect for broad-field lunar observations, medium-sized star clusters, and a wide range of cloudy nebulae and deep-sky targets. You'll be amazed with clear views you see on clear evenings. Reliable Guarantee: We provide 30-Days no reason return and 12-Month warranty. P.S: Our product is produced to provide years of enjoyment for you. If you have any question about the product and service, please feel free to contact us. We will do our best to solve your problem. Fully coated optical lens offers bright, clear views with excellent light transmission and color correction. Perfect for broad-field lunar observations, medium-sized star clusters, and a wide range of cloudy nebulae and deep-sky targets. Widest 52 degree apparent field of view with medium magnification, 12mm comfortable long eye relief. It is an excellent just right eyepiece with the soft detachable rubber eye guard and threaded base for various standard 1.25 filters. Comes with sturdy plastic case to protect the eyepiece from dust and moisture. GazerOptics 20mm Kellner eyepiece is a great choice for astronomical observation. All eyepiece elements are Fully Coated for additional light transmission, greatly improves the clarity of the edge images. Nice eye relief lets you view the entire field comfortably, especially for eyeglass wearers. Threaded for any standard 1.25inch astronomy filters and barlow lens. Comes with sturdy plastic bucket to protect the eyepiece from dust and moisture. 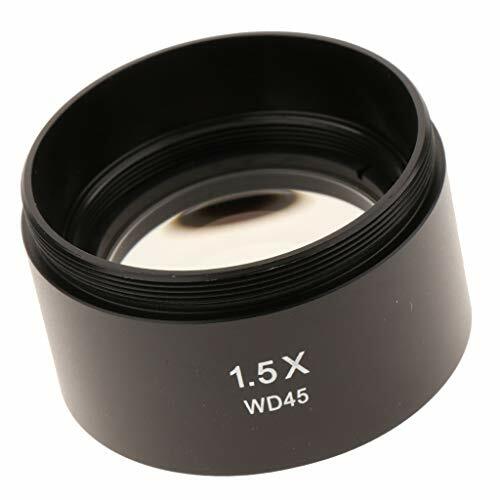 Fully Coated Optical Lens All eyepiece elements are Fully Coated for additional light transmission, greatly improves the clarity of the edge images. Long Eye Relief Nice eye relief lets you view the entire field comfortably, especially for eyeglass wearers. 1.25 Inch Eyepiece Interface Threaded for standard 1.25inch astronomy filters and barlow lens. Sturdy Plastic Dust Cover Comes with sturdy plastic bucket to protect the eyepiece from dust and moisture. Reliable Guarantee We provide 30-Days no reason return and 12-Month warranty. If you have any question about product and service, please feel free to contact us, we will do our best to solve problem. Gazer Optics 4mm 10mm 25mm Kellner eyepiece set is a great choice for a astronomical observation. 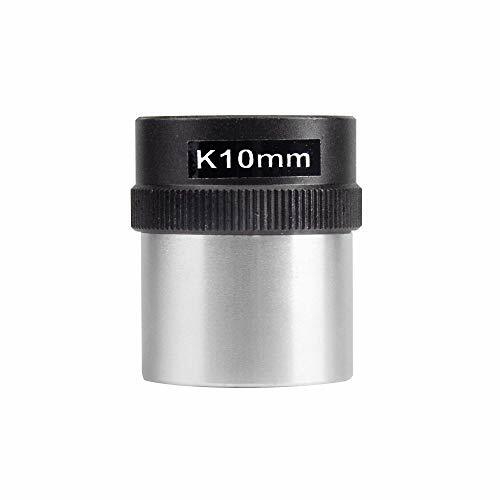 Kellner eyepieces sets 4mm 10mm 25mm will give you a good variation in magnification for a wide range of targets with extra sharpness. Suitable for observation of lunar surface;planets;stars and bright nebula internal. Suitable for observation of detailed lunar pits; planetary surface; star details and so on. Threaded for use with any standard 1.25" eyepiece filters. Protect the eyepiece from dust and moisture. Our product is produced to provide years of enjoyment for you. If you have any question about the product and service, please feel free to contact us. We will do our best to solve problem. 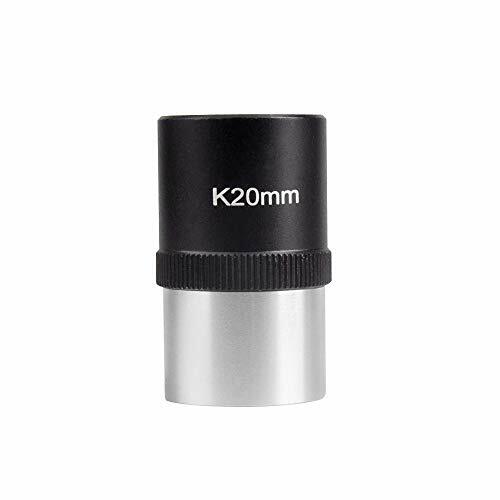 Good Variation In Magnification 1.25" 4mm 10mm 25mm Kellner eyepiece set gives you a good variation in magnification for a wide range of targets with extra sharpness. Service Warranty We provide 30-Days no reason return and 12-Month warranty. We promise to solve your problems within 24 Hours! 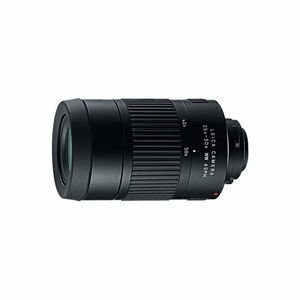 The GazerOptics 10mm high power plossl eyepiece is an excellent choice for astronomy enthusiasts looking for a high-power eyepiece to use with a telescope. 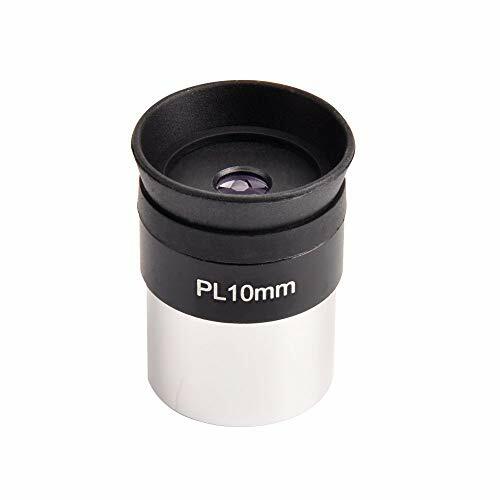 With a 10mm focal length and 1.25" barrel diameter, this plossl telescope eyepiece will yield high-power views in any telescope. 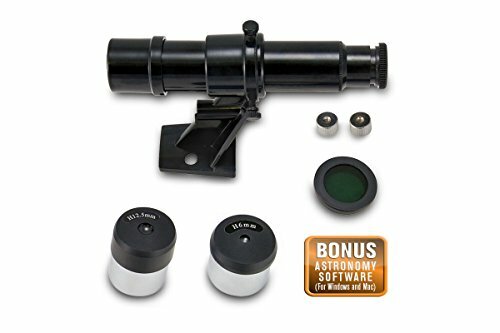 Ideal for close inspection of craters and mountains on the Moon, and for highly magnified views of planets such as Jupiter, Saturn, and Mars. You'll be amazed with clear views of Saturn and its rings on clear evenings, as well as Jupiter's stormy cloud bands and four closest moons Io, Ganymede, Europa, and Callisto. You can even go after challenging double stars with this powerful 4mm eyepiece. Fully Coated Optical Lens Offers bright and sharp images with excellent color correction for planetary viewing and daytime observation. Comfortable Viewing Widest 52 degree Apparent Field of View with high magnification, 12mm comfortable Long Eye Relief. 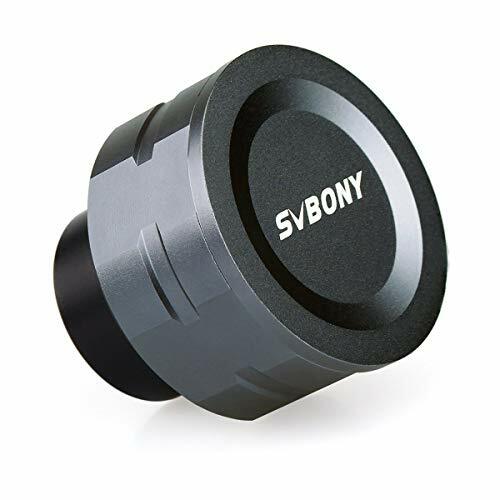 Standard 1.25 Eyepiece Interface Suitable for any standard 1.25 telescope filters and other astronomical devices. Soft Rubber Eye Guard Fit with a bayonet mount and folds down for the convenience of eyeglass wearers. Sturdy Plastic Dust Case Comes with sturdy plastic case to protect the eyepiece from dust and moisture. 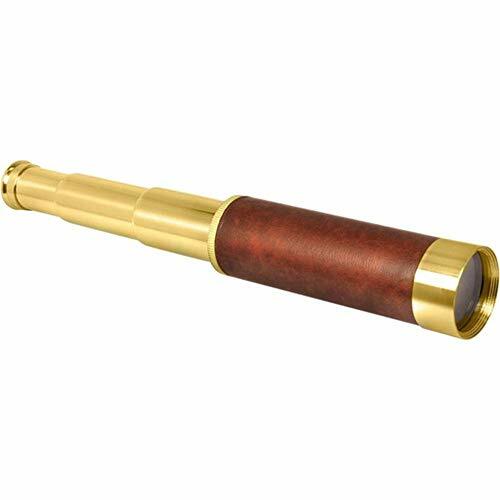 The GazerOptics 4mm high power plossl eyepiece is an excellent choice for astronomy enthusiasts looking for a high-power eyepiece to use with a telescope. 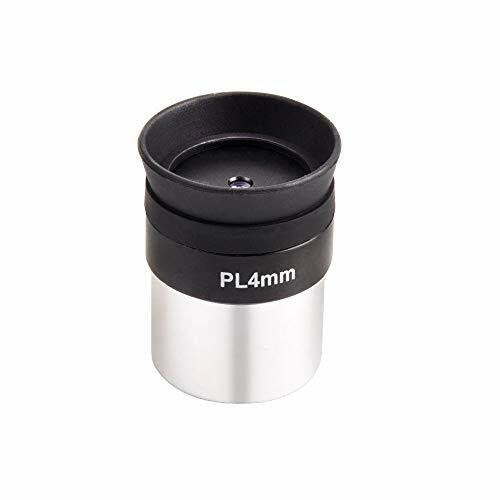 With a 4mm focal length and 1.25" barrel diameter, this plossl telescope eyepiece will yield high-power views in any telescope. Ideal for close inspection of craters and mountains on the Moon, and for highly magnified views of planets such as Jupiter, Saturn, and Mars. You'll be amazed with clear views of Saturn and its rings on clear evenings, as well as Jupiter's stormy cloud bands and four closest moons Io, Ganymede, Europa, and Callisto. You can even go after challenging double stars with this powerful 4mm eyepiece. GazerOptics 10mm Kellner eyepiece is a great choice for astronomical observation. - 1.5X barlow auxiliary objective lens for stereo microscope. - If the max magnification of your stereo microscope is 30X, this item can make it to be 45X. - Working distance (WD45): 45mm. - Mounting thread: 1-7/8" (48mm). - Easy to attach on objective - just screw it on. Note: Keep the scope folded and stored when you don't use it. 1. The main parts of the mirror body are aeronautical aluminium, with high-quality leather wrapped in the grip part, elegant appearance and heavy metal feeling on the hand. 2. The lens is made of Paul BAK4 prism, with clear vision and open and bright vision! 3. Shrinkage is very small! Easy to carry! Accessories: handbag, mirror cloth, instructions. 4. Pure optical glass, all surface coated with antireflective blue film, good imaging effect. 5. Perfect as a gift: Stylish and classic appearance, can be used as home furnishings or unique crafts. Feature: essential tool for jewelers, dozens of professional uses around home, shop and school Precision polished lens provide excellent clarity with minimal distortion lightweight and durable thermoplastic body fits comfortably in the eye Great for collectibles, arts and crafts, jewelry repair, electronics, science and repair the clock. Material: Plastic Package Included: 1 x Eyepiece Lens No Retail Box. Packed Safely in Bubble Bag. essential tool for jewelers, dozens of professional uses around home, shop and school Precision polished lens provide excellent clarity with minimal distortion lightweight and durable thermoplastic body fits comfortably in the eye Great for collectibles, arts and crafts, jewelry repair, electronics, science and repair the clock.